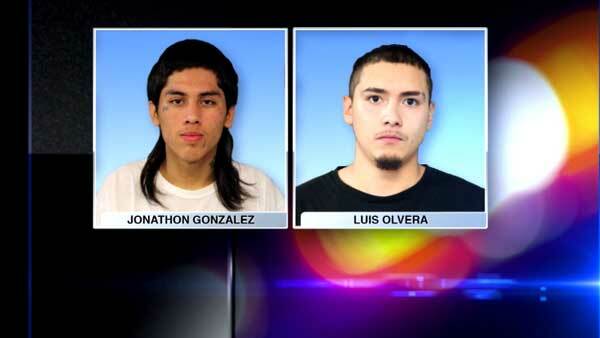 CHICAGO (WLS) -- Two men are accused of injuring two young children in an attack in Chicago's Little Village neighborhood. Police said Jonathon Gonzalez, 18, and Luis Olvera, 20, threw a fire hydrant cap at a car as they yelled gang slogans around 12:20 p.m. Monday in the 2600-block of South Kedzie Avenue. The cap shattered a car window. Two children were sitting inside the vehicle. The 4-year-old and 8-month-old suffered minor injuries but are expected to be OK.
Gonzalez, of the 2400-block of South Sawyer Avenue, and Olvera, of the 2400-block of South Troy Avenue, were both charged with two felony counts of aggravated battery to a child and misdemeanor criminal damage to property. Both men are due in bond court Wednesday.